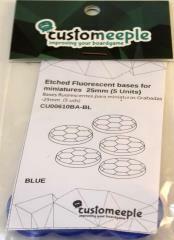 A pack of circular bases made of fluorescent methacrylate. You can use them as markers for your board games to make your figures look cooler than other players. They can also differentiate that some miniatures are from the same army or match the colors you used to paint them.